Landscape Artist Captures "Heaven and Earth"
Brad Aldridge is an accomplished and passionate artist. His work has been exhibited across the country for over two decades and is widely collected. Aldridge’s paintings capture the allure of picturesque landscapes found all over the world. His work revolves around the concept of deep metaphors revealed in nature, along with the life lessons that can be learned from them. Aldridge recalls himself always being attracted to the power of nature. As the youngest of six, Aldridge first started drawing when his mother was enrolled in art classes. He would sit and draw with her while she was working on her homework. The combination of his father’s position in the army, the frequent relocations, and his mother’s nostalgia for her home in the West influenced Aldridge to seek out the ideal landscape. As an adult his formal education only reinforced his desire to express the deeper meanings and metaphors uncommonly associated with the simplicity of “pretty” landscapes. 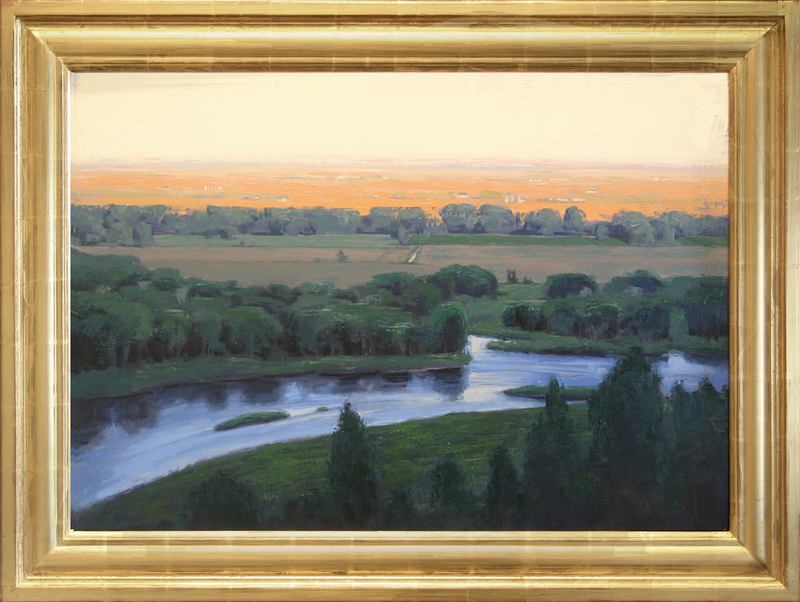 He wants to not only express how he views peaceful meandering streams and exquisite twilight horizons, but also his personal feelings and perspectives on the world. This idea of standpoint is one of the recurring themes and inspiration for his more recent works. In his new collection titled “Heaven and Earth,” Aldridge breaks from his traditional “worm’s eye” point of view and instead, chooses an elevated perspective. 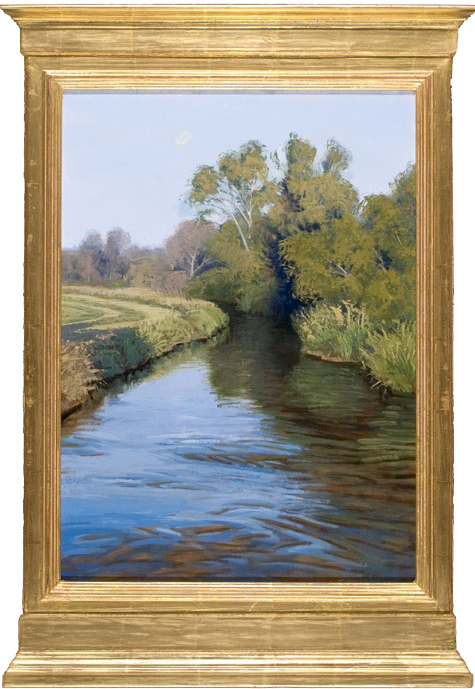 His work embraces the exquisite beauty and subtle intricacy of nature with subdued color schemes and soft, pleasant scenery of European vistas, serene fields, and winding roads and rivers. Aldridge’s paintings leave his audience with feelings of hope, tranquility, and peaceful solidarity. Bonner David: What is your intention for this new change in perception? Aldridge: I wanted to explore the idea of creation, or the heroic landscape. When you become elevated one has the opportunity to experience it as if you were composing or creating it yourself, the “creator’s eye view.” This perspective challenges the viewer to ponder on questions of creation and the relationship between Heaven and Earth. Aldridge: I supposed “Heaven on Earth” is more literal, but “Heaven and Earth” brings more mystery and leaves the paintings more open to interpretation. The audience can look for deeper symbolism and ideals. It’s like a dialogue between the world we live in versus our ideal world; the conversation between the two. Bonner David: What are some of the metaphors that will be present in the “Heaven and Earth” collection? Aldridge: “Heaven and Earth,” animal remains and the inherent danger of mortality, the vulnerability of being alone, exquisite beauty, subtle intricacy of nature, and hope for a new. Aldridge is featured in this month’s issue of American Art Collector (to read the full article click here Brad Aldridge-AAC). The opening reception for “Heaven and Earth” will be held at Bonner David Galleries (Map) on January 28, 2010 from 6-9pm. If you are in the area we hope you stop by to experience this stunning new collection in person. To read his full bio and view a complete collection of his work please click here. If you would like to receive more information about Brad Aldridge or to obtain a preview of the upcoming collection please contact us at art@bonnerdavid.com or call us at 480.941. 8500. Two Leader's in Art and Design, One Great Night! Scottsdale’s favorite gallery is teaming up with leading furniture and accessories brand McGuire for an exhibit that speaks to art and design lovers of all backgrounds. Viewing fresh artistic ideas is an exciting and memorable way to begin the New Year, so we are delighted to combine these two design traditions for a very special event. 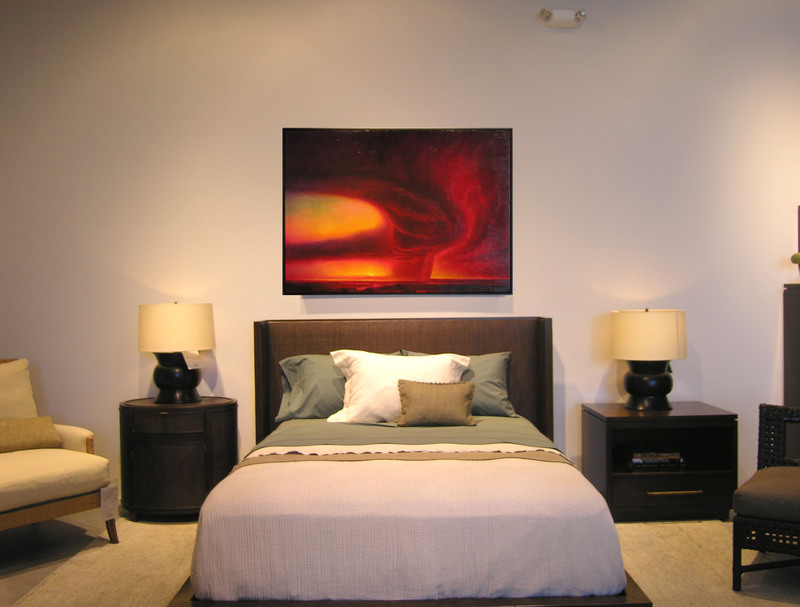 Nathan Fischer and Rich Bowman will be exhibiting their latest pieces alongside alluring and very contemporary McGuire furnishings. As light shines on Fischer’s metalwork, unexpected hues and movement emerge from his hand forged bronze panels, showcasing patina’s he mixes himself. Bowman’s enthralling sky scape scenes lend vibrant color, wispy motion and a tumbling light to the exhibition. McGuire’s use of natural materials and classic forms allows for a harmonious relationship with many styles of artwork. To experience the ensemble effect of both art and furniture side by side is a unique and thrilling opportunity not to be missed! As an added treat Eleanor Joseph will be providing a delectable assortment of her mouth-watering truffles. Her delicious chocolates are a favorite among Phoenicians and visitors alike and we are delighted to add this sweet touch to the evening! We hope you can join us for the special event on January 21, 2010 from 6:00-9:00pm at McGuire Showroom in Scottsdale, AZ (Map). You can also find this event featured in Phoenix Home & Garden Magazine (Read the full article Phx Home & Garden January 2010 Issue). A full catalogue of the show is available upon request. Please contact us at art@bonnerdavid.com or 480.941.8500 for more information about “New Art for the New Year” at McGuire Showroom; or to obtain information about any of the Bonner David Galleries artists. "New Art for the New Year"
Bonner David Galleries is delighted to welcome 5 artists who all possess their own distinctive techniques and styles to celebrate the beginning of 2010! These artists have joined together to give guests a wide variety of bold and exciting works that are sure to please, from various media to contemporary and traditional styles. John Schieffer and Francis Livingston interpret everyday images, one through realism and precision, and the other with a nostalgic eye for simple pleasures. Mixed media artist Carol Redmond includes her abstract works of colorful triptychs and grids, which compliment Liz Tran’s bright and stylized outdoor scenes exquisitely. Tran was featured in a special article in the December 2009 issue of Desert Living (Liz Tran- Desert Living). Lastly, John Harrell brings his cityscape paintings that showcase the beauty of light throughout the different seasons of nature. “New Art for a New Year” will be a very joyful and memorable exhibit that promises to be a highlight of the Scottsdale arts season! (Read the feature article in this months issue of American Art Collector…(Group Finery-Bonner David Galleries). Please join us on this Saturday January 16, 2010 from 1:00-5:00 pm at the gallery (map) for the opening of this exciting show. 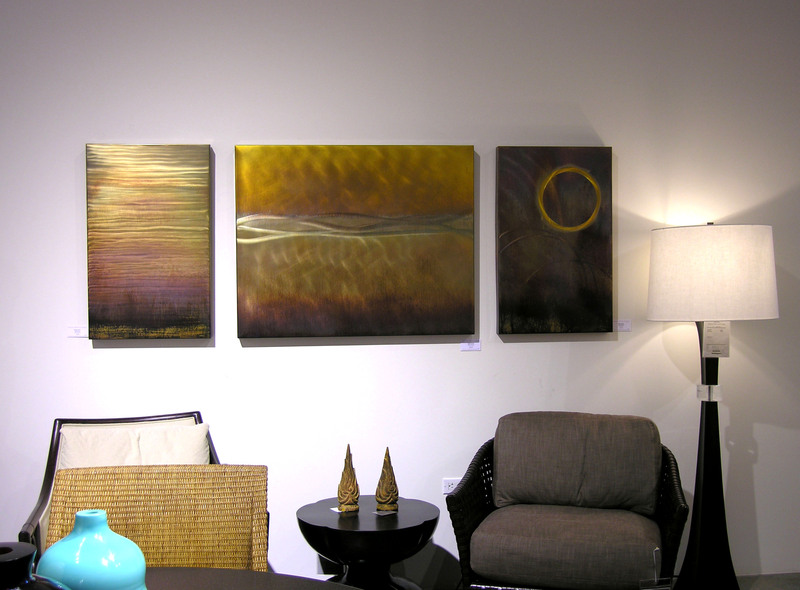 If you are not able to attend on Saturday, the show will hang for two weeks from January 16-27, 2010. We hope you can stop by and discover these amazing works. A full catalogue of the show is also available upon request. Contact us at 480.941.8500 or at art@bonnerdavid.com to receive additional information about the exhibition or any of the Bonner David artists. 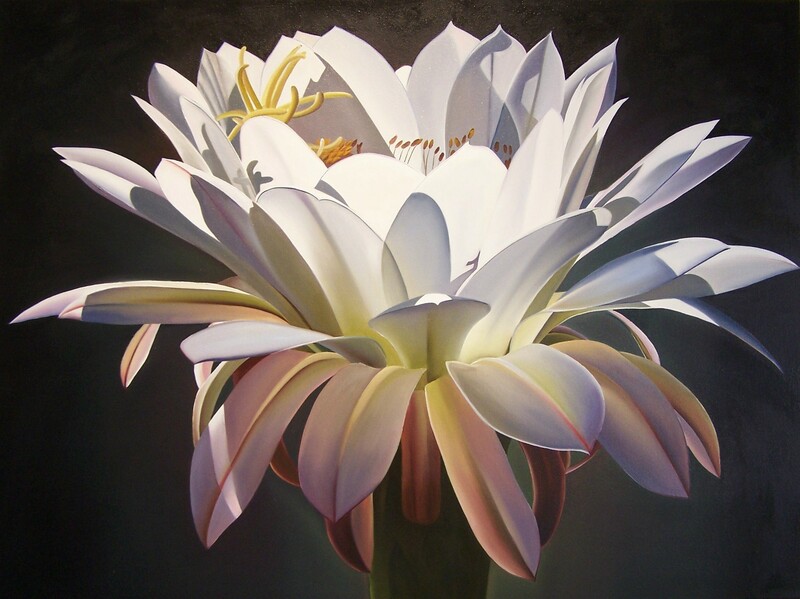 Dyana Hesson is an accomplished botanical artist. Her technique is exquisite and her accolades many. But beyond the canvas Hesson is a mother, wife, philanthropist, and all out life enthusiast. She uses her talents to glorify the beauty of creation and express her passion for helping others. Her art is an expression of herself in every way. To truly understand Dyana Hesson, we must delve into her past and examine the events that paved the way to her personal and professional success. Hesson was raised in California where she spent her time connecting with nature. As a child she helped in the garden and visited local nurseries, finding inspiration in the vast and diverse vegetation that the region offered. When she was twelve her father gave her a camera, and Dyana immediately started capturing the moments she found most interesting. She took pleasure in photographing flowers, plants, and the natural landscapes that surrounded her. But for Hesson, there was more to these experiences than a camera could offer. She became interested in painting as a way to express the things that she couldn’t through a lens alone. 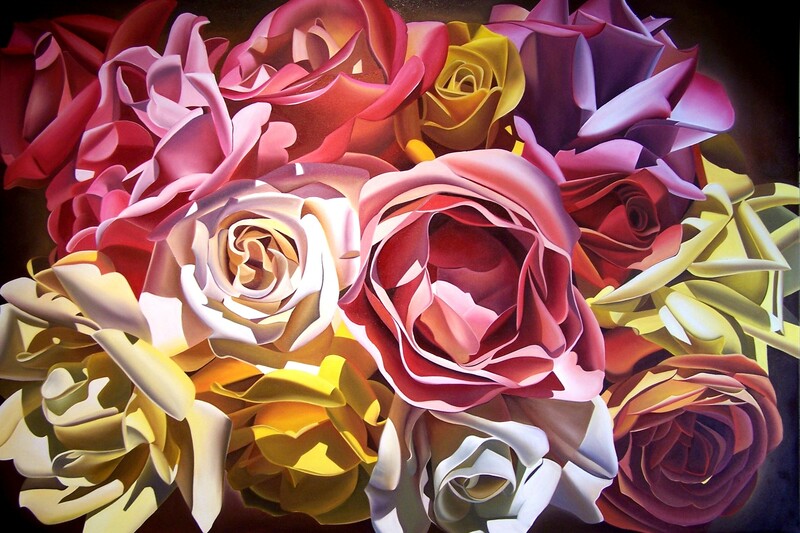 She began her study of painting in California and completed a degree of Fine Art from Arizona State University. 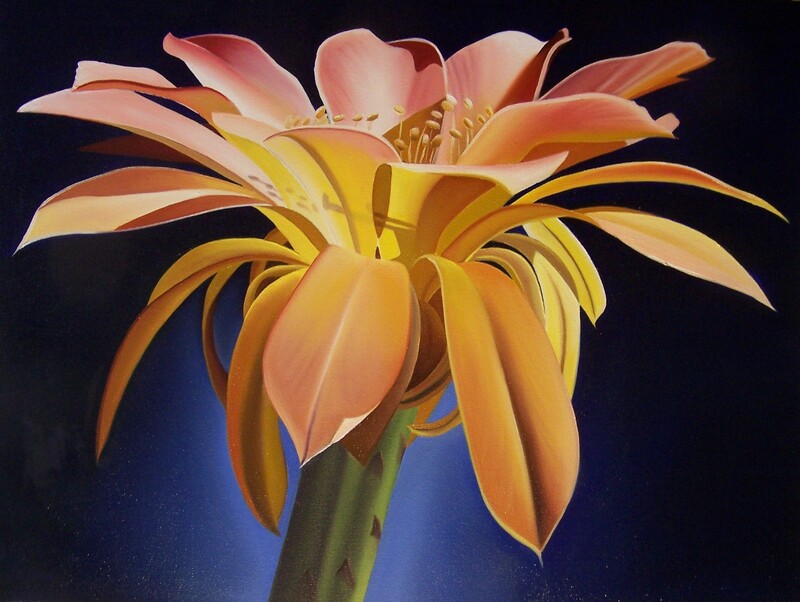 Hesson’s exquisitely painted botanicals are of rare perfection and unprecedented beauty. She is known for her technique of masterfully illuminating her subjects and adds subtle details of her own persona into each piece. Her work has been profiled in many national publications and she is prominently collected. Today she shares her life with her husband and beautiful daughter, as well as the many charities and community organizations that she is involved with including The Desert Botanical Garden, Banner Health, I-FADD, KKG, Arizona Humane Society, among others. The Show Hope Foundation holds a very special place in the heart of this artist. The organization helps prospective adoptive parents with the financial barriers to adoption. Having been adopted herself Hesson believes that every child should have the chance to grow up in a lasting and loving home. She has dedicated herself tirelessly to this cause and continues to raise money and awareness for the foundation. For the past few years Hesson has hosted a charity event here at Bonner David Galleries, with all proceeds benefiting Show Hope. The 2009 show “One Night, One Child” was a huge success and together we were able to help unite one child with loving parents. This year we are working hard to double our efforts. The 2010 charity event will be held on January 8 at Bonner David Galleries from 6-8pm. The night will mark the debut of Hesson’s latest collection “My Arizona” and will be complete with live music by VeeRona Ragone , hors d’ oeuvres by Trudy Maples, wine from Su Vino Winery, and a silent auction of the one of a kind painting “Ray of Hope”. Tickets are being sold for $20 and all proceeds benefit Show Hope. If you are in the area we encourage you to come and enjoy this special night and help us meet our goal of placing two children in forever homes. For more information about this event call us at 480.941.8500. 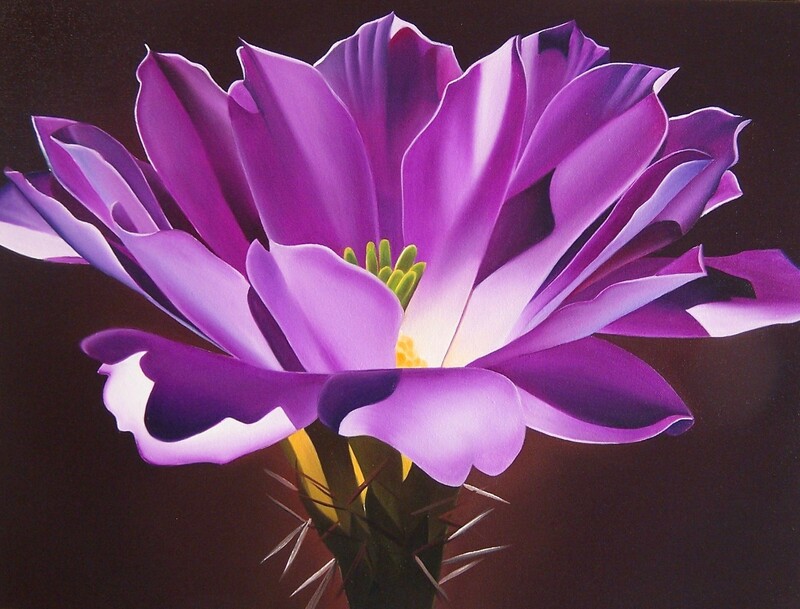 Hesson’s latest collection “My Arizona” is an amazing exhibition of exquisitely painted botanicals illustrating the wonders that lie in our own backyard. Each painting tells a story, and each story builds on the memories and relationships Hesson has forged. Her work embraces the natural bold colors of the southwest, and entices us all to step out and see Arizona in a whole new light. Hesson provides all of us with a rare opportunity to experience her journey of discovery, and encourages us to embark on one of our own. The new collection has also inspired Hesson’s fist printed book. One special person will have a chance to win a signed copy at the January 8 charity event. The book is available for sale at Blurb.com. For more information or to obtain a full list of the collection please email us art@bonnerdavid.com or call us at 480.941.8500.